Welcome to Hobart and the Apple Isle. Your two night Special Stay at your dockside hotel in Harbour View Rooms includes a special Taste of Tasmania welcome dinner. Delve into Tasmania’s convict past with a visit to World Heritage-listed Port Arthur. Your guided tour includes a cruise to the Isle of the Dead for a fascinating insight into the lives and deaths of Port Arthur’s past residents, both convicts and free settlers. Visit the lush rainforest of Mt Field National Park, Tasmania’s oldest National Park, and the location of the spectacular three-tiered Russell Falls. Witness history in the making with your visit to the ‘Wall in the Wilderness’, a wood-carved history of the Central Tasmanian Highlands. A continuous work in progress, Greg Duncan has hand-carved a series of scenes into panels commemorating those who have shaped the area’s past and present. Travel to Queenstown before arriving in the picturesque village of Strahan, where you will stay tonight. Cruise through the World Heritage-listed Franklin-Gordon Wild Rivers National Park. From the luxury of the Captain’s Premier Upper Deck enjoy a gourmet lunch of local Tasmanian delicacies. 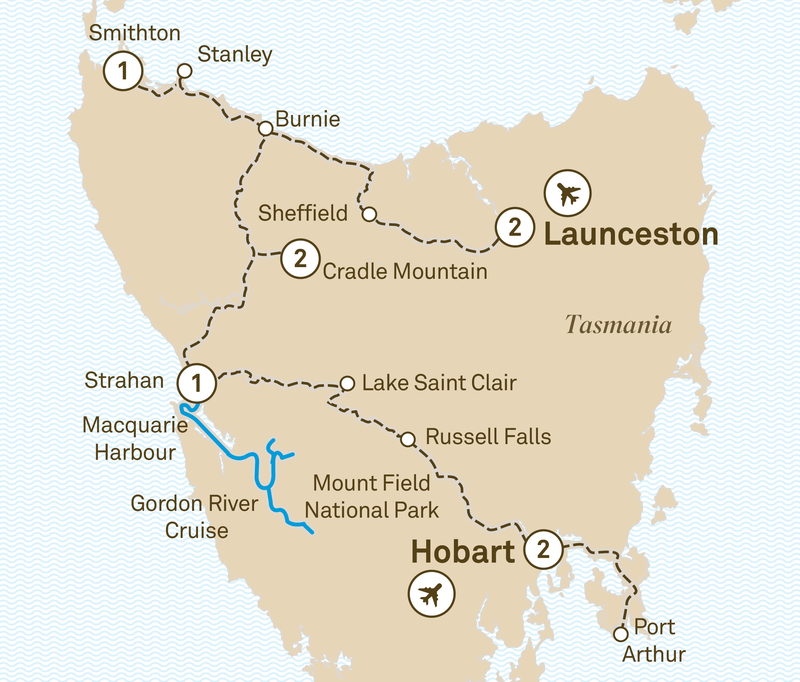 Cruise through Macquarie Harbour and visit Heritage Landing and Sarah Island. This afternoon, take in the pristine alpine vistas of Cradle Mountain-Lake Saint Clair National Park, where you’ll enjoy a Special Stay for the next two nights, right amongst the alpine wilderness. Keep your fingers crossed for clear skies this morning to be treated to magnificent views of Cradle Mountain and breathtaking reflections on Dove Lake. Hear the stories from your local guide about the intrepid early settlers of this area. Leave the mountains for the coastal towns of Burnie and Penguin. Visit Hellyers Road Distillery and take the whiskey walk, learning about how whisky is distilled and matured in Tasmania. Enjoy the rugged coastline on the way to the village of Stanley. Enjoy Tasmanian hospitality tonight as you stay overnight at Smithton. Visit the town of Sheffield and discover its history, geography, wildlife and people from the murals that are painted on the walls across town. Upon arriving in the charming city of Launceston, visit Cataract Gorge and ride the chairlift to take in its beautiful scenic views. Your two night stay is in Launceston. It’s time to say farewell to new-found friends and the wonders of Tasmania.